Who’s hyped for Rascal Flatts!! That’s right, if you missed their “Back To Us,” tour last year, you’re in luck – they’re back on the road again in 2019, with the massive Summer Playlist North American tour!! With special yet-to-be-announced guests, they’re on their way to the Budweiser Stage on Thursday 12th September 2019!! 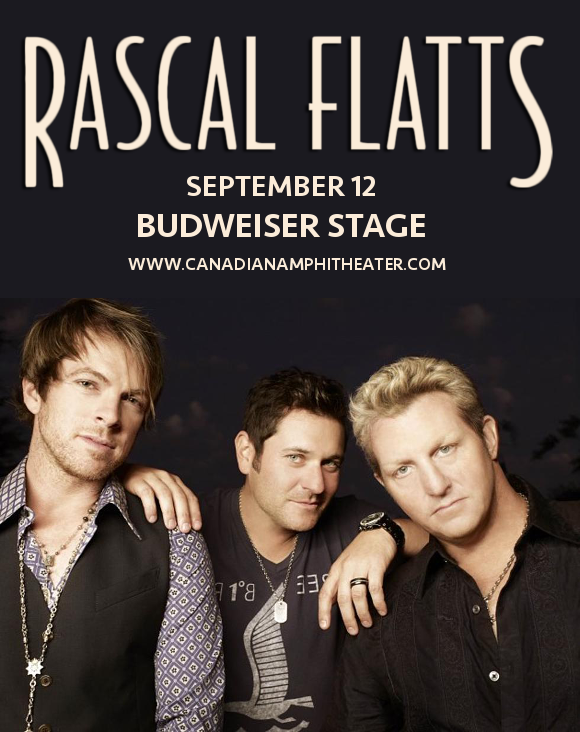 Don’t miss what promises to be a truly epic show – get your tickets to see Rascal Flatts TODAY, while they last!! Formed by Gary LeVox, Jay DeMarcus, and Joe Don Rooney in 1999, Rascal Flatts broke out with their first, self-titled album just one year later, causing a flurry of attention among country lovers everywhere for their strong vocals, lush harmonies and amazingly catchy melodies!! It’s no wonder they’ve had an astonishing 14 of their singles top the country charts, and many of those cross over into the mainstream pop charts too. Now, the band are touring with their most recent album, “Back To Us”. “This tenth album is so weird because we had as much fun on the tenth as we did on the first,” explained singer Gary LeVox sayid in an interview, confirming the band’s opinion that the latest record is a throwback to the very sounds that audiences loved the band so much for in the first place. “Maybe more!” added guitarist Joe Don Rooney. So, it’s as good as their first album and maybe even better… and you’re still considering whether or not to see them live?? It’s a no-brainer – grab your tickets QUICKLY, before they go! !